Glow Yoga has been providing mobile Rainbow style yoga enrichment programs to Edmonton & area schools and groups since 2011. Our main goal was influenced by the teachings of the great Amanda McFadyen (www.blisskids.ca) and that is to "uplift and empower children to feel happy, healthy and connected". Glow Yoga classes are catered to the age, skill level, core curriculum and interests of our students. We are here to provide them with a non-competitive, supportive, and fun environment in which to explore the movement of their bodies and stimulate their perception of what is possible. 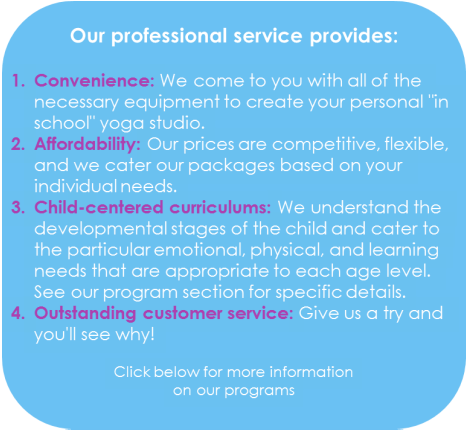 Our instructors are certified yoga professionals who are trained in working with children both in and out of the yoga studio.